If you want to create a high-converting landing page, you need a lot of skills. You need to be able to create a mockup design, then convert the design into code and then A/B Split Test multiple variations to improve conversion rate. As you might have guessed, this not only requires a lot of different skills but also takes a lot of time. And if you don’t have these skills yourself, you will have to spend literally thousands of dollars just to get someone to create a landing page for you. This is where Landing Page Builders come to rescue. They offer an easy-to-use drag-and-drop interface to create high-converting pages in minutes. The best part is that they come with pre-made landing page templates that are already field-tested and proven to have a high conversion rate so you can put them to work building your email list, adding people to your sales funnel, selling products and any other action you wish people to complete on your website. So, even if you don’t know how to code or aren’t good with design or don’t have a clue how A/B Testing works, you can still create high-converting landing pages without breaking the bank. Landing Page Builders can save you a ton of time as you aren’t starting from scratch and are using pre-made templates that are proven to have a high conversion rate. Now, there are a lot of Landing Page Builders available on the internet and it might get really confusing when trying to find one that’s affordable and fits the bill. So, to save you hours of research, we have compiled a list of the best landing page builders available for WordPress. OptimizePress is one of the most popular and the oldest Landing Page builders available for WordPress. Unlike other tools on this list, OptimizePress is more than just a landing page builder. It also allows you create membership portals for your website. The membership portal is based on a custom version of S2Member. It comes with over 30 landing page templates to choose from. The templates include Webinar Registration Pages, Thank You Pages, Confirmation Pages, and Free Training Pages. You can use their LaunchSuite (that comes along with the tool) to create highly customized product launch sales funnels within minutes. The editor offered by OptimizePress allows you to edit almost every aspect of your landing pages and comes with over 40 different conversion focused elements to choose from. While the software comes with over 30 customizable landing page templates, it also comes with access to the OptimizePress marketplace which offers over 350 free and premium landing page templates you can download. The premium templates on the marketplace are available for purchase starting at $8. All the landing pages you create with OptimizePress will be mobile-ready and will look great on all screen sizes. A/B Testing to help you split test your landing pages against different variations to improve conversion rate. Over 30 highly customizable landing page templates. Comes with integration support for major Email Marketing services including Aweber, iContact, MailChimp and InfusionSoft. 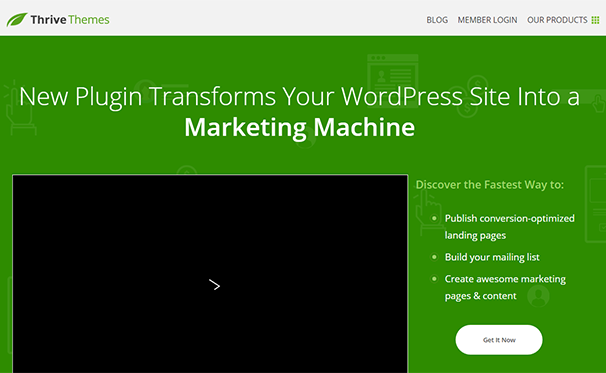 Thrive Landing Pages is a Landing Page Builder plugin for WordPress by Thrive Themes. It comes with over 150 of templates to choose from. It offers a simple, easy-to-use drag-and-drop interface that helps you build landing pages within seconds without writing a single line of code. Most of the templates are offered in sets to help you keep the branding consistent over multiple landing pages. These sets include templates for Webinar Pages, Squeeze Pages, Thank You Pages and Sales Landing Pages. The editor offers dozens of conversion focused elements like Video, Images, Testimonial, Price Comparison Tables, etc. It allows you to customize almost everything there is on your landing page including Call-To-Actions, Testimonials, Background Color, and much more. It loads up fast and comes with undo/redo functionality. When you buy Thrive Landing Pages, you also get access to Thrive Content Builder which is another great plugin by Thrive Themes. It helps you create stunning content that improves user-experience, gets more shares and increases your brand’s credibility. Over a hundred customizable templates to choose from. Most of the templates are offered in sets to help you maintain branding across multiple landing pages. 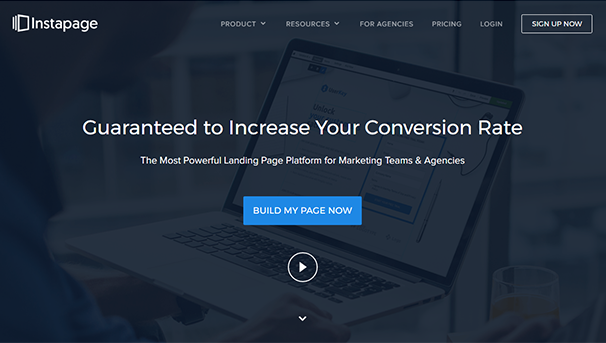 An easy-to-use drag and drop builder that allows you to build landing pages within minutes. In-built A/B Split Testing functionality to help you constantly improve the conversion rate of your landing pages. While LeadPages does come with a WordPress plugin, it is not just a WordPress plugin but a web application. It offers a very easy-to-use drag and drop builder to help you build high-converting landing pages within minutes. With LeadPages, you get the choice of either publishing the landing pages on your own website server or directly on a customized LeadPages subdomain. Another great thing about LeadPages is that with this tool, you are not stuck with just WordPress. You can download the HTML code of the pages you create and upload it on any platform you want. They offer over 160 high-converting, field-tested landing page templates. These templates are the ones that the creators of LeadPages have used and perfected over time. The templates are available in a lot of different categories you can be sort by industries or average conversion rate across their platform. If you run out of templates that come with the tool, you can always get more from the LeadPages marketplace. 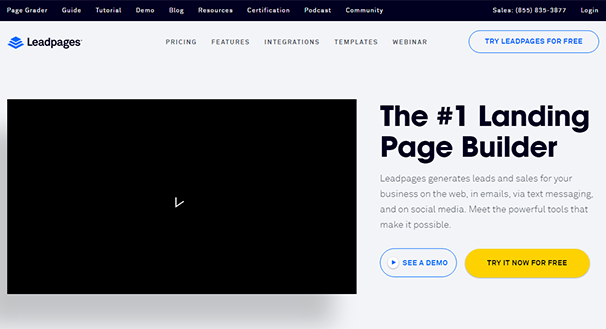 LeadPages not only allows you to create Landing Pages, but it also allows you to create popups (called LeadBoxes) that you can display on your landing pages and website. These popups can be triggered on a click of a button or when the user is about to leave the page. You can edit these LeadBoxes with a drag-and-drop editor that is similar to that for landing pages. If you are just starting out, LeadPages might not be a very affordable option. It’s pricing starts at $37/month and doesn’t include a lot of features like A/B Split Testing. But if cost is not a problem for you, then LeadPages has tons of value to offer. On the other hand, if you are looking for a more affordable option, Thrive Landing Pages might be a better choice. It starts at just $67 per site for one year of support and unlimited updates. Integrates with over 40 different platforms including MailChimp, Aweber, ConvertKit, Drip and Constant Contact. Over 160 templates to choose from that you can sort by industry, type and average conversion rate across the platform. A/B Split Testing to help you achieve the highest conversion rate possible by split testing multiple variations of your landing pages. An easy-to-use drag and drop builder. Comes with LeadBoxes (Popups), LeadLinks and LeadDigits to help you get more leads. 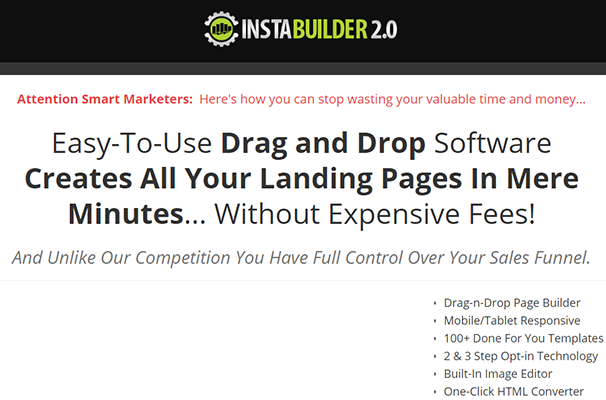 Instabuilder is a drag-and-drop landing page builder that comes with over a hundred highly customizable landing page templates. The drag-and-drop interface is easy to use and helps you customize the templates within minutes. While the software is a WordPress plugin, you don’t need WordPress to actually publish the pages. It allows you to export the landing pages you create as HTML so you can publish them on websites that don’t use WordPress. You can also integrate Instabuilder with Facebook if you are interested in publishing your landing pages as Tabs on your Facebook page. Over 100 templates to choose from including Landing Page templates for Squeeze Pages, Sales Pages, Video Sales Pages, Webinar Pages, Upsell Pages, Launch Pages, Thank You Pages, Coming Soon Pages and much more. It comes with in-built A/B Split Testing functionality to help you split test your landing pages against multiple variations to improve conversion rate. Over 100 hundred customizable templates. A clean drag-and-drop landing page builder. Integration support for major Email Marketing Services like MailChimp and GetResponse. It also comes with integration support for GoToWebinar. Export Landing Pages to HTML with just one click. Comes with an easy-to-use in-built image editor. All landing pages you create with Instabuilder will be fully mobile responsive and will look great on all devices. In-built A/B Split Testing to help you achieve better conversion rates for your landing pages. Ability to create 2 Step and even 3 Step opt-in forms. Instapage is not a WordPress plugin but web-based landing page builder. It comes with over 200 high-converting landing page templates that you can sort by industry. The templates include landing page templates for Squeeze Pages, Launch Pages, Thank You Pages, Confirmation Pages, Video Sales Pages, Sales Pages, Webinar Pages and much more. All landing pages you create with Instapage are fully mobile-responsive and work on all mobile devices. You can use Instapage to publish landing pages on your website or directly under your username on the Instapage domain. It also allows you to export your landing pages as HTML so you can publish them directly on your own servers. Instapage comes with integration support for major Email Marketing Services including MailChimp, Aweber, GetResponse, InfusionSoft, Constant Contact, Mad Mimi and Campaign Monitor. It comes with in-built A/B Split Testing to help you achieve the highest conversion rate possible by split testing multiple variations of your landing pages. The drag-and-drop builder offered by Instapage is easy-to-use but comes with a bit of a learning curve if you have never used a design software like Photoshop before. Unlike other drag-and-drop tools on this list, Instapage is built to increase the amount of customization possible. If you are simply interested in adding a few text blocks, images and videos to quickly create landing pages within seconds, Instapage might not be the best option. Not to say that Instapage can’t accomplish it, but other tools on this list are a better option if that’s what you are looking for. Over 200 landing page templates to choose. You can sort the landing page templates by industry and category. In-built A/B Split Testing support. Integration support for major marketing software including Aweber, MailChimp, ActiveCampaign and Mad Mimi. 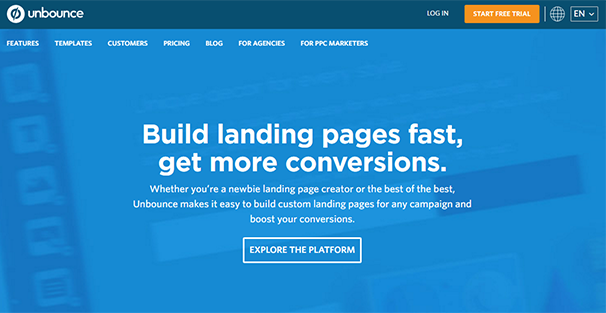 Unbounce is a landing page building platform that is created with Web Designers in mind. While it can help you create high-converting landing pages quickly and easily, it’s a tool made to help web designers easily re-create (or directly) create their landing page designs inside of this tool just like they would in Photoshop. While the tool does come with almost everything you will need to create high-converting landing pages, we would not recommend you to go with Unbounce if you just want to quickly build landing pages and don’t care much about the design aspects. If you are just starting out, Unbounce is not the most affordable option and should be avoided as the pricing starts at $99/month for up to 75 landing pages. That’s a lot of money if you are just starting out. Unbounce also allows you to create pop-ups for your website and landing pages that they like to call Overlays. Comes with in-built A/B Split Testing functionality to help you achieve the highest possible conversion rate for your landing pages. Over 125 Landing Pages and Overlay templates to choose from. Integration support for major Email Marketing Services including MailChimp, GetResponse, Aweber and Campaign Monitor. Price: Starts at $99/month for just 75 landing pages. If you still can’t decide, let me make it easy for you. 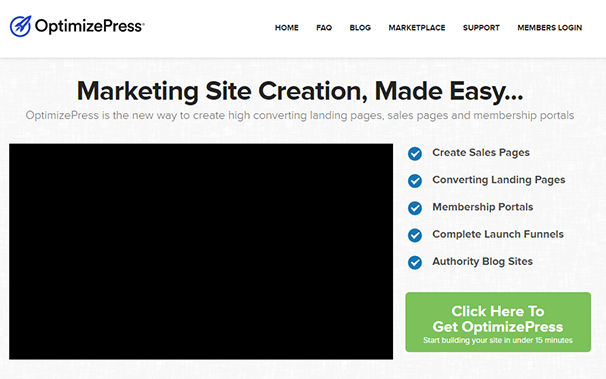 If you are looking for an easy tool to quickly create landing pages, OptimizePress is the best choice. It offersover 30 landing page templates to choose from. The templates include Webinar Registration Pages, Thank You Pages, Confirmation Pages, and Free Training Pages and allows you to build high-converting landing pages within minutes. On the other hand, If you are looking for a web-based application, LeadPages is the way to go. It allows you to quickly create and publish high-converting landing pages. And it offers dozens of landing page templates that have a high conversion rate. It comes with an easy drag-and-drop builder that allows you to build landing pages within minutes. Or are you a designer? Someone looking to turn mockup designs into real landing pages. If that is the case, you should go with either Unbounce or Instapage. They both offer a workflow and interface similar to that of tools used to design websites such as Photoshop. While Instapage is suitable for everyone, Unbounce is more suitable for designers looking to turn mock-ups into real landing pages. Whatever tool you choose, the important thing is that you start building your email list. And start generating leads for your business. Because at the end of the day, the number of leads you generate is all that matters.